7 double cabins, 4 of which have additional Pullmans for children. She accommodates 14 guests in seven double cabins, four of which have additional Pullmans for children, thereby accommodating up to 18 guests in all. Both the exterior and the interior of MUTIARA LAUT represent a harmonious fusion of eclectic Asian and classic European craftsmanship in an effortless symbiosis of modern stylishness and old world charm. Mutiara Laut sleeps up to 18 guests in six double staterooms, four of which are convertible to accommodate an extra single bed. Beautifully decorated, the cabins have been finished with intricate Balinese carvings, local crafts and textiles, and intricate handcrafted tiles in the large en suite bathrooms. Outside, Mutiara Laut benefits from a large 60-metre square open deck with oversized beanbags, sunpads and al fresco dining under the oversized Bimini. With a dedicated masseuse on board, a fleet of water toys and scuba diving for both certified and beginners, she will cater to all guests’ leisure activities. 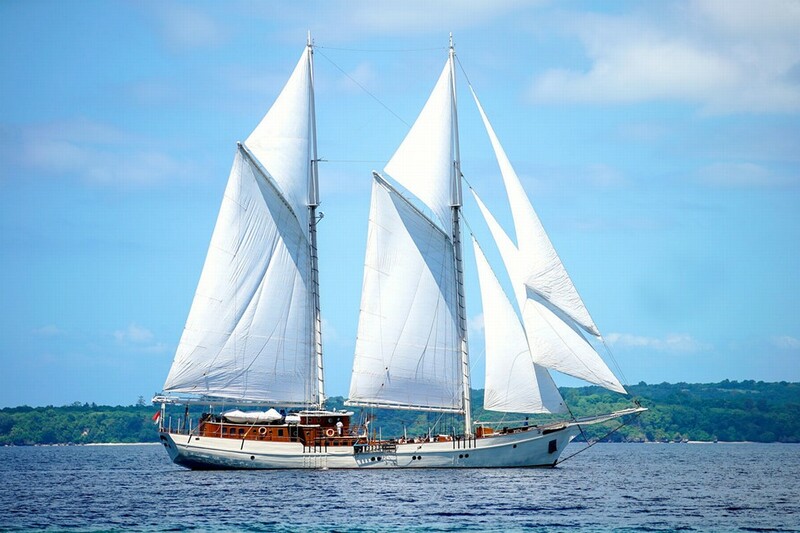 Available to charter in the most remote and exotic areas of Indonesia, Mutiara Laut offers an exceptionally authentic luxury sailing experience. Itineraries and spa menu available upon request. Please click here for a Photo Presentation of MUTIARA LAUT. Please click here for information on SCUBA DIVING aboard MUTIARA LAUT. Lying in the coral triangle stretching from the Philippines to Timor to Papua New Guinea, Raja Ampat is known as the most biodiverse marine habitat on earth. It is one of the most outstanding dive locations with 75% of the world’s coral species found in Raja Ampat alone (That’s 10 times more than in the Caribbean) including 3,000+ species of fish and 700 species of mollusks. It goes without saying that diving is exceptional whether it be big pelagic fish, muck diving, drift diving, walls, wrecks; the water is constantly warm and visibility excellent. Raja Ampat can be visited all year round but the best period is from October to April. Please click here for a Raja Ampat Destination Guide. $77,000 US a week all inclusive year round, private, whole boat charter…. ALL MEALS on board (additional charges will apply for any special food requests incurring charges relating to the transport of such items into Indonesia). Itineraries and pricing for extras available upon request. 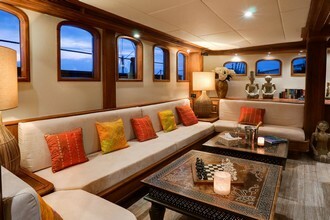 MUTIARA LAUT offers charters by the cabins also. Please inquire for dates. 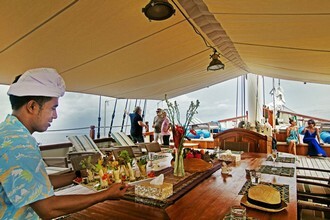 This stunning Schooner offers an exceptional authentic luxury sailing experience, cruising the exotic waters of Indonesia.